All the years I've lived in Frankfurt, and I haven't yet been to the Frankfurt Book Fair. But that changes this year. I'm determined to go. And I've even got the okay from my boss that, if I look for books suitable for the creche I work at, she'll pay for my ticket! I'm really excited, and I'm hoping there will be names or faces I recognize there. So if you are going to be there, or you know of writers (or agents?) or other publishing industry names that will attend, leave me a comment. I'd love to connect ... or at least to say, "Dude, guess who I saw!" I'll be sure to bring my camera. For more information on the biggest book fair in the world, check out the website here. It was just a year ago that I interviewed an amazing writer by the name of Laura Schultz. 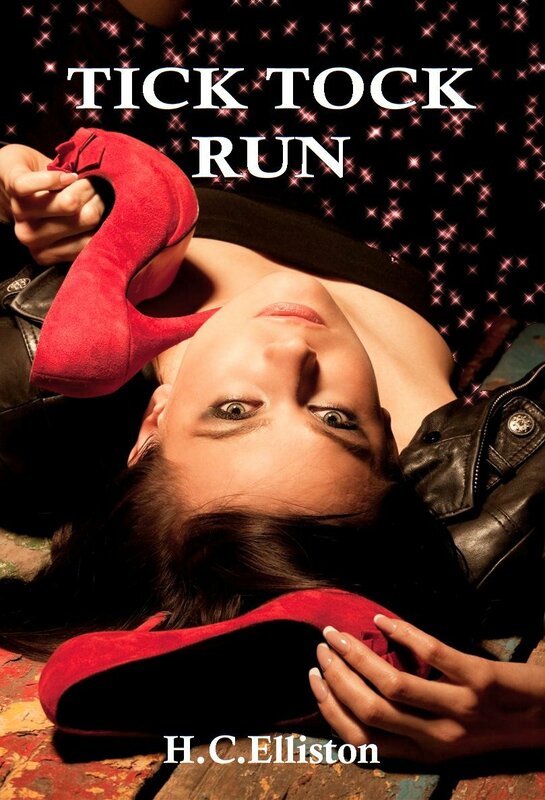 Now, Laura's debut poetry book is available! It's called Arise and Shine: Laments from the Darkness, Songs from the Light. 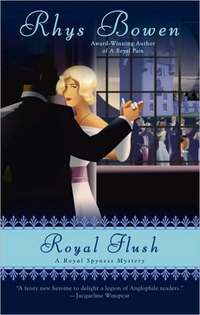 Published by Silver Bow Publishing. This debut poetry book by Laura Schultz is evocative, passionate and enhanced with 21 color photographs by Anton Mueller and paintings by the poet's mother. Laura wields her paintbrush and takes us on a memorable journey down the pathways of her heart into the core of her soul. Check out Laura's book here! Mid-September already, can you believe it? It seems time is flying fast. With so much to do, and deadlines to do them by, I have to apologize if the blog seems a little slow. Theoretically I'd like to post at least three interviews a week, but you'll have to excuse me if I can only manage one. If anyone can understand me, writers can. Right? So let's welcome our next interviewee. This time we're talking with a lovely lady who's written an exciting book. Say hello to H.C. Elliston. Hi, Helen! Tell us a bit about yourself. I live in West Yorkshire with my fiancé and dogs, near to my fiancé's children. I am a pet portrait artist, a vegetarian, and a trustee for a local animal rescue charity. People would probably describe my desk as organised chaos – and they’d be right! Hmmm... what else? I leave scraps of paper in every room so that I always have something at hand to write ideas on. I love hot chilli sauce, chocolate and icecream. Oh, and I adore my two dogs! I started writing about 4 years ago and have been hooked ever since! Tell us about TICK TOCK RUN. What’s the story about? 105,000 words, 388 pages, of suspense, mystery and romance with a little humour thrown in. TRUST NO ONE. SUSPECT EVERYONE. The main character Chelsea receives a threatening e-mail which contains a ticking countdown timer. Likely it is spam or a virus, but when she crosses paths with a man at a bar whose brother had died after receiving a similar message, she realises her life is in danger. Someone has dragged her into a frightening game of revenge. 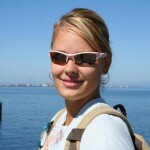 Chelsea decides to find her assailant before he or she finds her. Soon, she starts to mistrust her instincts as she is thwarted by the people closest to her who have their own hidden agendas. The death clock in an email idea came to me while sitting with my dogs in my garden. One of those moments when you’re not even trying to think of ideas, and hey, presto! Plot aside, I wanted to write what I enjoy in books and movies, and take the reader through a range of emotions. People often have to get creative to solve their own daily problems. I have simply done this on a larger scale. I enjoy throwing my characters into awful situations and watching them try to battle their way out. I have a fantastic group of critique partners. It is so important to get other eyes on your work. Sometimes I can be so inside my own story that my brain fills in the errors, be it grammatical issues, plot holes, POV issues. Critique partners help ensure that I have covered all my bases, and help whip my stories into shape! I agree, critique partners are very valuable. What’s the hardest part of writing for you? I would have to say it is writing the first quarter of the book when I take my opening problem/scenario to a higher level, and I am still getting to know my characters. Coffee, coke, silence, and then a glass of wine later on. I tend to drop out of reality while writing. I need peace and quiet to be able to really put myself inside the scene in order to paint the picture and portray emotion. Wouldn’t it be great to be able to snap your fingers and end up in a different location! Quick writing test! Use the following words in a sentence: sheep, satellite, and birthday party. When the satellite dish thudded to the ground, the sheep dog bolted across the lawn knocking a party guest who fell onto the birthday cake. A huge thanks to my critique partners for their help and encouragement, my friends and family for their support, and to readers for taking a chance on a new author! My second novel is due for release in September, for a sneak preview please visit my website. 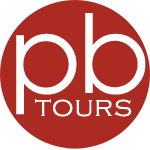 Speaking of websites, where can people find you and your book online? The download version is available on Amazon, Smashwords, ibooks & Barnes & Noble. 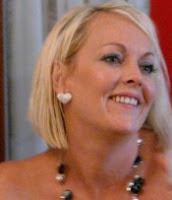 My author website is http://hcelliston.co.uk, and includes links to Twitter and Facebook. Thanks so much for chatting with us, and good luck with your books! Thanks for the interview, Dorothy! 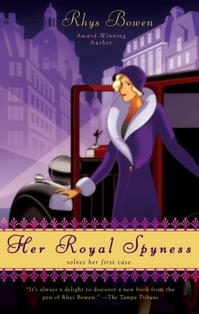 My next guest is a delightful writer who has written a very interesting spy series. 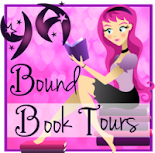 Let's jump right into the interview and get to know Rhys Bowen and her books. Hello, Rhys! Tell us a bit about yourself. Born and raised in England, lived in many places before settling in California. I'm married to a fellow Brit. We've four children and 5 grandchildren. We love to travel and now live in Arizona in the winter. I've been a professional writer all my life--last 15 years specializing in mysteries, my favorite reads. 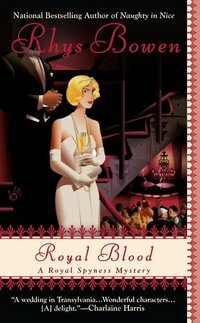 Tell us about the Royal Spyness series, and in particular, about NAUGHTY IN NICE. I wanted to write a series that was fun,funny, suspenseful and a little romantic. So Lady Georgiana is 34th in line to the English throne in the 1930s but her branch of the family is penniless. She's trying to make her own way during the Great Depression while those around her still live the life of the rich and famous. 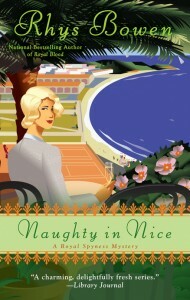 In Naughty in Nice the queen sends her on a secret assignment to the Riviera, to recover a stolen snuffbox. Her adventures include modeling for Chanel, flirting with a dashing marquis and finding a body. 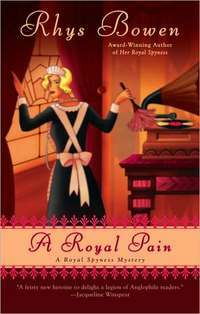 Lots of fun and I love including real people... Mrs. Simpson and the Prince of Wales, for example. This book has already received a starred review from Publisher's Weekly and is a RT Reviews top pick so it's off to a good start. Sounds awesome! What’s the hardest part of writing for you? Not the ideas. They are lining up to be used. It's juggling the whole promotional part with my writing time. Interesting, and an aspect I'm sure many aspiring authors don't often think about. Any tips you’ve learned about writing you’d like to share? Yes--only write a book to please yourself. Your book has to read as if you're having a good time writing it. And work on writing the best book of which you are able. The rest will happen. Great tip. Let’s get to know you on a deeper level. What do you absolutely have to have nearby when writing? My toys--wind up teeth, a couple of tops to spin, Egdar bobblehead and more. I need an excuse to stop and play when things are getting tense. LOL, truly an original answer. If you could have any super power, what would it be? To bring about world peace? End hunger? Actually it would be cool to be able to fly. Quick writing test! Use the following words in a sentence: parchment, glowing, and antelope. "And our specail tonight," the chef said, waving at the glowing embers of a barbecue, "is antelope haunch in parchement." LOL, ew. Here’s the part where you thank the people who are supporting you. Let's hear your shout outs. This could be as long as my novels: my family who have been so supportive. My agents Meg and Christina. My editor Jackie Cantor and publicist Kaitlyn Kennedy. May amazing SEO guru Terry Kate. All my writing friends in the mystery community--they are the most amazing warm and nurturing bunch. My Facebook friends and finally the ones I owe most too--my fans. If they didn't read my books and tell others about them, I'd still be at step one. I'm on Facebook and Twitter and love to hear from my readers. Thanks so much for chatting with us, Rhys. I look forward to reading your series. Good luck with the new book! Thank you for a fun interview! I love doing author updates. It makes me feel the vitality of the writing community. 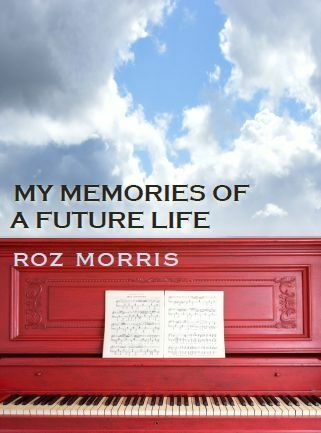 This time we're catching up with author Roz Morris. I interviewed Roz back in January. Now her new book is out, so let's find out what it's about. Welcome back, Roz! Tell us about your new release. Traveller's Wife for the Derren Brown era. It's already been called groundbreaking by one reviewer - the link is here. Here's what the novel's all about. If you were somebody's past, what echoes would you leave in their soul? Could they be the answers you need now? The main character, Carol, is a concert pianist. She's a gifted musician who needs nothing more than her piano and certainly doesn't believe she's lived before. But forced by injury to stop playing, she fears her life may be over. Enter her soulmate Andreq: healer, liar, fraud and loyal friend. Is he her future incarnation or a psychological figment? And can his story help her discover how to live now? A novel in the vein of The Time Traveller's Wife, Vertigo and The Gargoyle, My Memories of a Future Life is much more than a twist on the traditional reincarnation tale. It is a multi-layered story of souls on conjoined journeys - in real time and across the centuries. It's a provocative study of the shadows we don't know are driving our lives, from our own pasts and from the people with us right now. Like Peter Shaffer's plays The Royal Hunt of the Sun and Equus, it asks questions about what we believe, what we create and how we scare and heal each other. Tell us the good and the bad: What was the hardest thing about writing this book and what was the easiest? The easiest? The research! I thoroughly enjoyed immersing in some fascinating, rich subjects. For instance, the world of classical music, where The language of music on a score is so dictatorial, with instructions for how long you play a note, in fractions of a second, which requires immense dexterity and control. Professional players are like Olympic athletes. And playing is almost like a form of spiritual possession. There are instructions for expression - for instance, amoroso, which means 'play it lovingly'. That's awesome - they tell you how you feel while playing the music. I got a strong sense of music as almost being like channelling the spirit of the composer. Of course, it's not always like that, but I wondered what it would be like for a character who felt it was. A lot of this fed into what music means to my main character Carol - and what she loses when she can't play. Literally, it's her way of feeling alive. 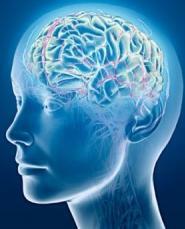 Also I had to research hypnosis and past-life regression. This is a rich subject indeed. The person undergoing it is put into in a highly suggestible state and asked to describe where they are and what they're doing. They come up with incredible stories - sometimes very traumatic. I was interested in what really happens under the surface - who was pulling strings, what it means, but a lot of it defies logic. No matter how you look at what's going on these people are going through profound and changing experiences. The hardest thing was writing the end. I had to decide at what point we could cut and leave the characters to get on with their lives. I wrote several different endings and always had a clenched feeling in my stomach that I'd been hard on a character, or had left something important unsaid. When I finally got the right one, I knew - but it took a lot of soul searching. You knew this was coming -Quick Writing Test! Use these words in a sentence: masquerade, Tupperware, and liquid nitrogen. As the hypnotist spoke the Tupperware party disappeared; in its place appeared white clouds like liquid nitrogen, and a mysterious masquerade. Spooky! LOL. Where can our readers find your book? A print edition will follow but there's no URL for that yet. I'm releasing the novel first of all as 4 novellas on the Kindle, of roughly 25k words each, one a week, 0.99c each. This is, of course, an experiment, but it seemed to work pretty well for Mr Dickens. And with the Kindle offering new ways of reading, it's about time someone did it again. My agency Sheil Land are watching keenly to see if this is a model they should use for their own ebook releases. Very exciting times! Thank you, Dorothy, for having me back - and for all you do with this website. I've discovered some terrific authors on these pages and I'm thrilled to be here too. I'm so glad. Thank you for telling us about your new book. I'll be keeping my eye out for it. 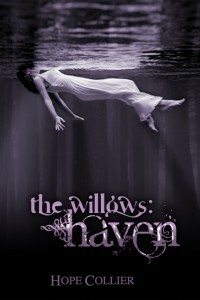 Today begins the ARC tour of Hope Collier's debut YA novel, THE WILLOWS: HAVEN. Not only is Hope an amazing writer, but she also heads up Soul Fire Press, the YA division of Christopher Matthews Publishing. Talk about having your hands full! Let's celebrate Hope's ARC tour with an interview. Welcome to We Do Write, Hope. Tell us a bit about yourself. I am a twenty-something year-old wife of one and mom of two. I love anything to do with nature, especially trees. I form odd attachments to things like keys and compasses. I buy them compulsively like Mel Gibson with The Catcher in the Rye in the movie Conspiracy Theory. Music is the biggest influence when it comes to my writing. Indie and alternative are the best. My favorite color is purple. I love flowers but hate the smell of orchids. One day, I want to write a Tim Burton-esque novel. Sounds great! How long have you been writing? I’ve been writing for as long as I can remember. I penned and illustrated my first book in the first grade entitled, The Bear and the Balloons. My teacher had them covered and bound like a real book. That was the first moment I really knew I wanted to be a writer. As far as Haven goes, I began it at fourteen. I wrote forty pages longhand, laid it down for twelve years then picked it up again in 2009. The cover of THE WILLOWS: HAVEN is absolutely stunning. What’s the story about? Thank you so much! My cover team is simply amazing. When tragedy strikes, seventeen year-old Ashton Blake sets out on a cross-country road trip, leaving the comforts of Malibu for the mountains of Kentucky. Along the way, she encounters Gabe Willoughby—the mysterious drifter with eyes like the sea and a knowing smile. Getting to know Gabe raises questions about her past. But no secret can be buried forever, and Ashton soon finders herself in a world where water is air and myth becomes reality. Just as Ashton comes to accept her newfound heritage, she’s summoned to fulfill a treaty laid down centuries before — a treaty that will divide her love and test her loyalty. In the end, her future isn’t her biggest concern, her humanity is. To run may mean war, but is she strong enough to stay? The story sounds fascinating. How did the idea come to you? The characters told me. I know that sounds odd, but the male lead, Gabe, was the first to have a voice. As cliché as it sounds, I had a dream about these two beings who were just inherently good. They intrigued me, so I started thinking about their lives. Eventually, it turned into a story of whom they could help and how. After some arguing on their part and some concession on mine, we decided to let them show me what was going to happen. I have the best betas and critique partners ever! Twitter can be thanked for that. I’m a member and co-founder of the Goodreads group, Chirenjenzie, as well as a small, private group of fabulous ladies on Twitter, @KappaDeltaWrite. Some might disagree with me here, but I firmly believe it’s impossible to edit your own work. That doesn’t mean you can’t get your manuscript super shiny, but there’s always something to catch, whether it be plot holes or grammatical issues. You’re just too close to the story to fully appreciate it. As my friend Beth says, “It’s a party in your head.” You know what’s going to happen. That makes it tough to know if you’ve covered all your bases. I tend to overdo everything. My wonderful, super-hero of an editor’s favorite words are chuck, omit, and streamline. I see everything play out in my imagination. I want the reader to see it like a movie. The downside to this is you see those things without knowing it when you’re watching a screen. It isn’t so smooth on the page! I think the best (and most important) thing I’ve learned is always have fun! Writing is tough enough when you actually enjoy it. The day you don’t, is the day you won’t want to write anymore. Also, avoid passive voice like the plague. Accept the fact that no matter how wonderful your book is, someone won’t like it. Don’t take it personally. Lastly, never give up writing if that’s where your heart lies. Great advice. Let’s get to know you on a deeper level. What do you absolutely have to have nearby when writing? Music! I can’t write or edit without it. Also, a drink! Sweet tea when I can get it, diet Mt Dew when I can’t. Oh, that’s a tough one. Probably something lame but functional like super-human, knowledge retention. I love words and information. It would be nice to act as a walking encyclopedia as long as I wasn’t annoying! Quick writing test! Use the following words in a sentence: stun gun, baby carriage, and antacid. The gritty antacid crunched between my teeth as the stun gun’s volt surged through the man stealing the baby carriage. So simple, yet so visual! Here’s the part where you thank the people who are supporting you. Let's hear your shout outs. Thanks to my awesome family for their endless support and willingness to share me with my muse. All my amazing and wonderful writing friends. You’re too numerous to personally share here, but you each know who you are and how much I love you! Much thanks to book bloggers who selflessly share our work with the world. And to the incredible readers who make writing so fun, I owe you an organ. Hope, I wish you and your book tons of success. Thanks so much for letting us chat with you.